I heard a theory (and I don’t know whether or not it’s true) that western medicine grew out of studying cadavers, while in the eastern world cutting up the dead bodies was frowned upon. As a result, western medicine doesn’t have a concept of vital energy in the body, while eastern physicians had developed sophisticated ideas about the flow of human energy from having to study living-breathing human beings. Whether or not that’s true, one thing is certain – yogis derived their way of understanding the world from personal observation and experimentation, and the flow of prana (vital energy) was of major significance. 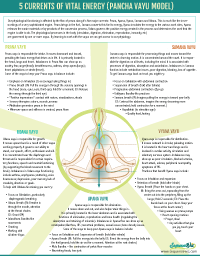 According to the yoga tradition there are five major currents of vital force that run through the body and organize it’s physiological functioning. This is known as the Pancha Vayu Model. If you think about your day-to-day functioning, you will see that it follows a predictable pattern: you take things in (food, water, information, experiences); then you process them one way or the other; then you absorb the nutrients or knowledge from the processing; you eliminate the stuff that you don’t need; and as a result you grow, both physically and mentally. This is an example of your vayus (currents of prana) at work. Diarrhea? – Apana vayu is too strong. Constipation? – Apana vayu is too weak. Cold hands and feet? – Your Vyana vayu (responsible for circulation) is not strong enough. Digestive issues? – Your Samana vayu is clogged up and not churning properly, etc. Sometimes it’s a bit more complicated and can involve several vayus not getting along. But what does this knowledge give you? It helps you design an appropriate practice to address a specific concern. Here is a quick outline of the vayus and the practices that might help bring them back to balance. PRANA vayu is responsible for the INTAKE. It moves downward and inward, providing the basic energy that drives us in life. It is primarily located in the head, lungs and heart. Imbalances in Prana flow can show up as anxiety, fear, anger (head); breathlessness, asthma, sleep apnea (lungs); heart palpitations or stroke (heart). APANA vayu is responsible for elimination. It moves down and out and also helps retain things in. It is primarily located in the lower abdomen and is associated with functions of elimination, reproduction and bone health (regulating the absorption and retaining of minerals). Imbalances in Apana flow can show up as constipation/diarrhea, IBS; menstrual problems, sexual issues; bone density issues. Vedas say: “Mortals eat food with Apana, while the gods eat food with Prana” (mortals are the physical tissues; the immortals are the senses that receive nourishment directly through the sense openings in the head). While the right food sustains Apana, right impressions are required to feed Prana. As we grow spiritually we must learn to take in more prana to feed the spiritual powers within us. 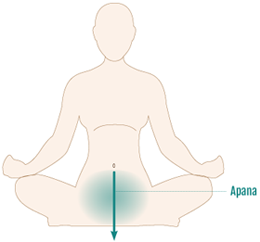 We need to control Apana, particularly the sexual function, not to drain vital energy downward. Apana, which is aligned with the force of gravity, moves downward resulting in disease, aging, death and the diminution of consciousness. 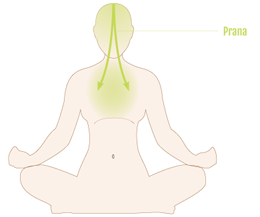 Prana, which is aligned with the air and space elements, disperses upward through the mind and senses. This leads to loss of mind-body coordination and devitalization. Uniting these two primary vayus results in strengthening our energy along with awakening our higher faculties. Yogic practices work to raise Apana up to unite with Prana and draw Prana down to unite with Apana, which occurs in the region of the navel – the pranic center of the body. SAMANA vayu is responsible for processing things and moves toward the center in a churning motion. It is concentrated around the navel. It is responsible for digestion on all levels, including the mind. It is associated with processes of digestion, absorption and assimilation. 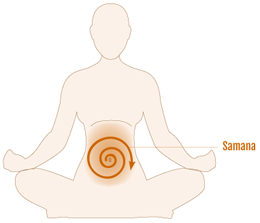 Imbalances in Samana vayu function include metabolism issues, poor digestion, bloating, loss of appetite. VYANA vayu is responsible for distribution. It moves outward in a circular, pulsating motion. It is located in the heart and lungs and is involved in cardiac activity, circulation and voluntary nervous system. 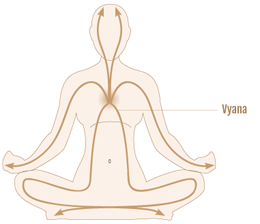 Imbalances may show up as poor circulation, blocked arteries, heart attack, edema; peripheral neuropathy, symptoms of MS.
Vyana Breath (Place the hands on your chest. Vyana and Samana vayus are opposite as forces of expansion and contraction. Vyana allows for differentiation of elements and grants each their separate sphere of activity. Samana brings about the integration of the elements and keeps them connected. Samana regulates agni (digestive fire) with fuel, which must burn evenly. 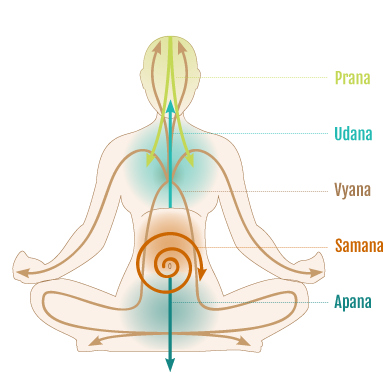 Vyana governs the movement of prana through the nadis, keeping them open, clear, clean and even in their functioning. UDANA vayu is responsible for growth. It moves upward and is a result of other vayus working properly. It governs our ability to stand, our speech, effort, enthusiasm and will. It is concentrated near the diaphragm and throat and is responsible for certain respiratory functions, speech and mental functioning (by supporting the blood movement to the brain). 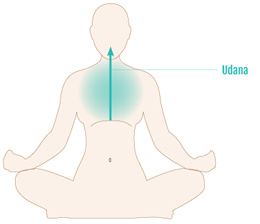 Imbalances in Udana vayu functioning include asthma, emphysema; stuttering, voice hoarseness; depression, poor memory, lack of creativity, direction or goals. Now, let’s say you’ve conducted your interview with a new client and it is clear to you that there is some imbalance in her Apana vayu. The last thing you want to do is pronounce: “Your Apana vayu seems to be clogged, so we will be working on un-clogging it!” Usually we want to keep our specialized lingo to ourselves and use this knowledge as a guide in designing a practice (while considering her other issues as well). Once you get a clear vision of the location and direction of movement of specific vayus, it becomes much easier to understand and work with your clients’ physiological and mental-emotional issues. Western medicine is based on physiology, the processes in the living body. The notion that it is based on anatomy is a complimentary medicine myth. 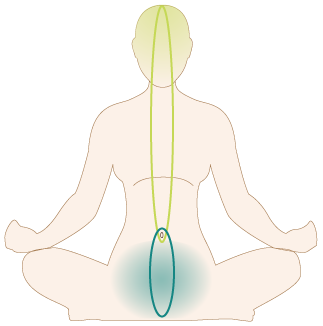 I have a situation wherein when I meditate, I experience a sensation rising up the spine, however it gets stuck at Anahata Chakra, and doesnot move beyond. Please suggest how do I progress further (move it beyond Anahata to vishuddi Chakra).